Sustainability of designs and architectural products can only be achieved by minimizing the negative impacts on nature, as well as being able to respond to the psychological needs of not only physically but also the humanitarian contribution to the environment in harmony with the culture and history of the people in which they live. Considering social aspects such as user profile and local context are very important in terms of the long life of building use, happiness, and prosperity of users, positive contribution to the region as well as the social and physical development of the city. 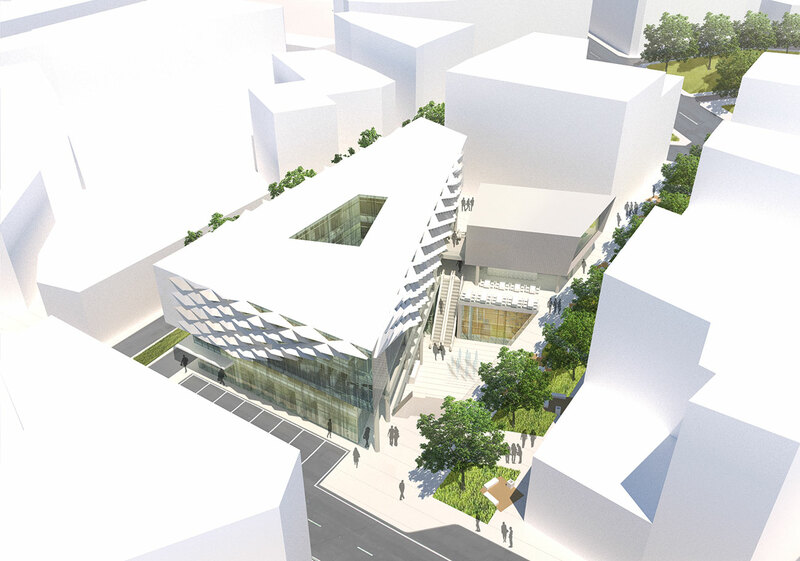 In this context, Merzifon Municipality Business and Life Center design's primary goal has been to establish a relationship with the environment, to lay the groundwork for the social needs of individuals such as gathering, meeting and to transform the area into a multi-dimensional living center serving the different expectations of Merzifon and the community nearby. For this reason, the center was constructed by bringing together the open, semi-open and closed areas, which focus on the living area, where the region will function as a city square, taking advantage of climate data. In contrast to a closed volume that turns its back on the environment, an approach that totally senses the environment has been adopted. It is essential that the new structure should be in agreement with the whole of the city. For this reason, although the building site seems to be physically separated from the urban focal point of the city, the ability to bring together the social pattern has become one of the main building blocks of this consensus. 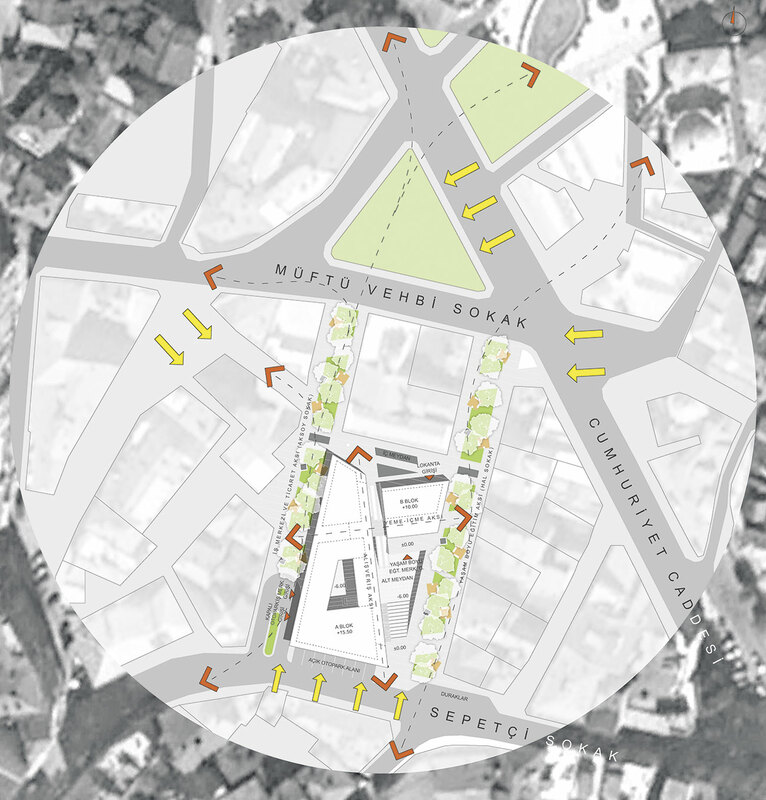 The branches of the design area are seen as fluid fields extending from the Mufti Vehbi Street to the city square. The design is a whole of flowing fields. 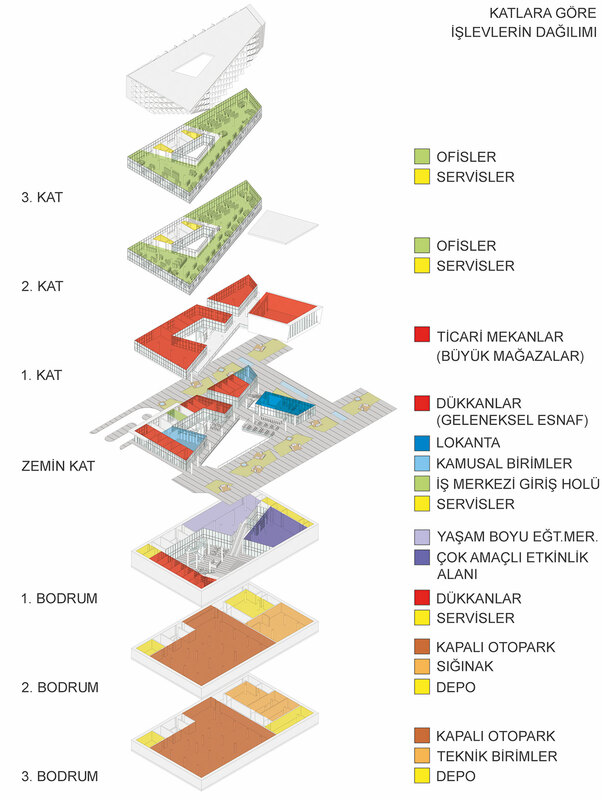 Different floors have been organized according to the characteristics of the program components by creating the differences in the levels so that they are connected visually and the activities within them are intended to have their own permeable boundaries. In the center of the area, there is an open-air theater which strengthens the links between the lower square and the upper connections. On the ground floor, the shops of the traditional artisans, which are built together, represent functional divisions on the one hand and psychological unity on the one hand with open pedestrian promenades. The pools, green spaces and resting places around the building are creating natural shade and humidity balance that will enable the living area to stay in the climate comfort conditions at all hours of the day. 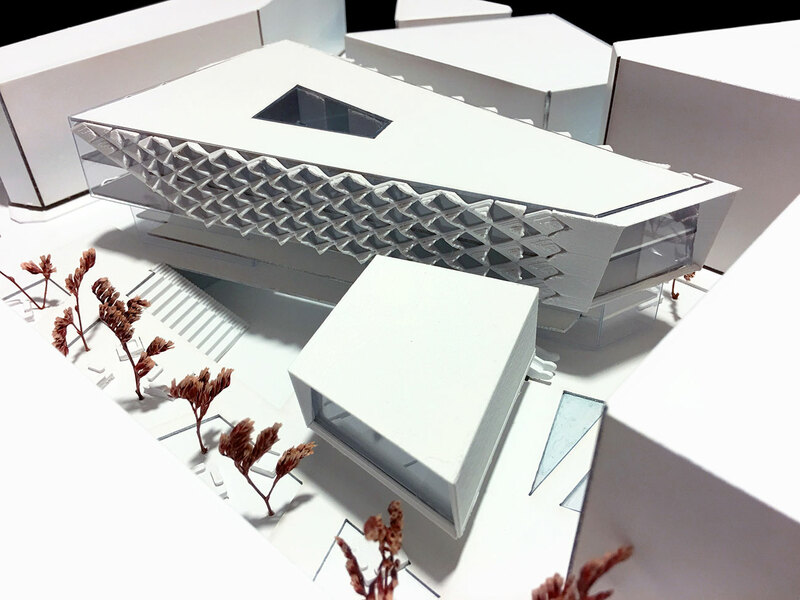 Another parameter considered in the context of climatic comfort conditions is the building’s shell. It is one of the main actors in relation to the environment of shell construction. Although it is thought that being an image for society and creating an identity is one of the most important roles of this actor, it is seen that the role of physical environment data is occasionally left on the second plan. However, when the shell can establish this relationship properly, it can contribute to the sustainability of construction, its operation, energy conservation and once again its structure identity with all these characteristics. 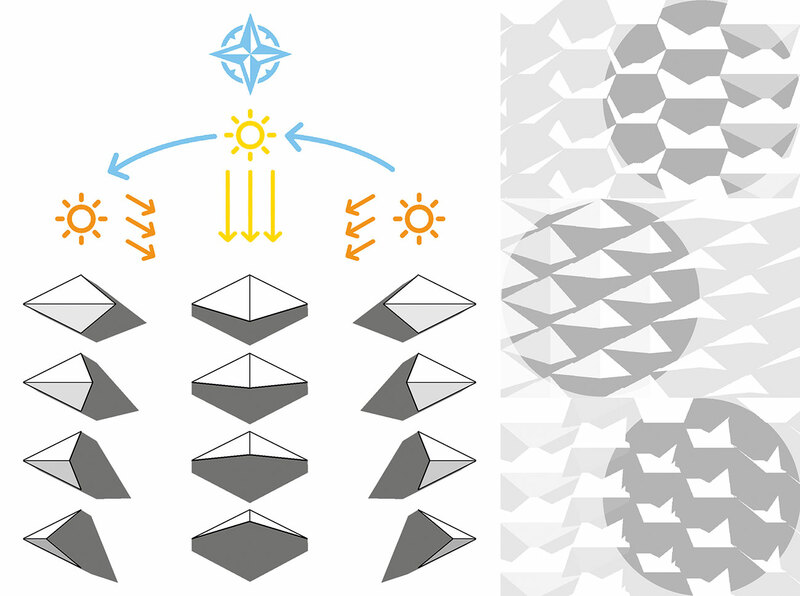 The design is arranged in such a way that the geometric watermarks created on the shell are handled in different contexts and provided the peace of the work with the sun rays making different angles at different seasons. The concept of flexibility in the room played a decisive role in the design decisions. It is one of the fundamentals of social sustainability that the shape or even personalization of spaces according to the needs of the individual can be personalized. 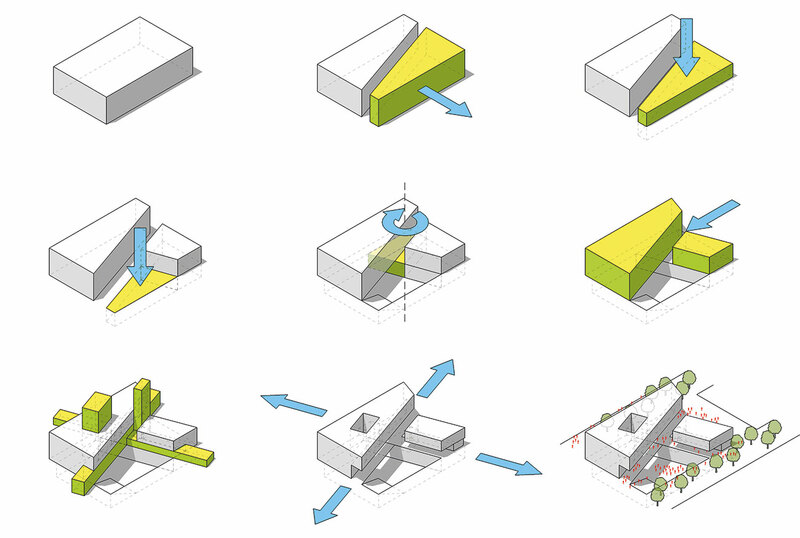 In this context, rentable areas with flexible design principles of different specifications and sizes have been included to enable the use of shops and offices of different sizes in the upper levels. In addition to the size of the spaces, the arrangements that allow diversity in the interior space and dynamism in the use of the spaces have been provided; the multipurpose hall located on the lower ground floor has been foreseen to be used for various purposes in a form suitable for its name. In this way, the potentials of the spaces have been supported. Every point of the design was evaluated within the scope of universal design principles and accessibility was taken as a basis.